As travellers, we want to keep memories of the places we visited for as long as we could. That’s why we take so many photos during our trips, right? But even with thousands of photos and videos, sometimes memories just fade away as time goes by. That’s a sad truth. That is one of the reasons why I write a blog. Besides providing travel information, I have my own selfish agenda, which is to preserve my stories and memories during my trip. 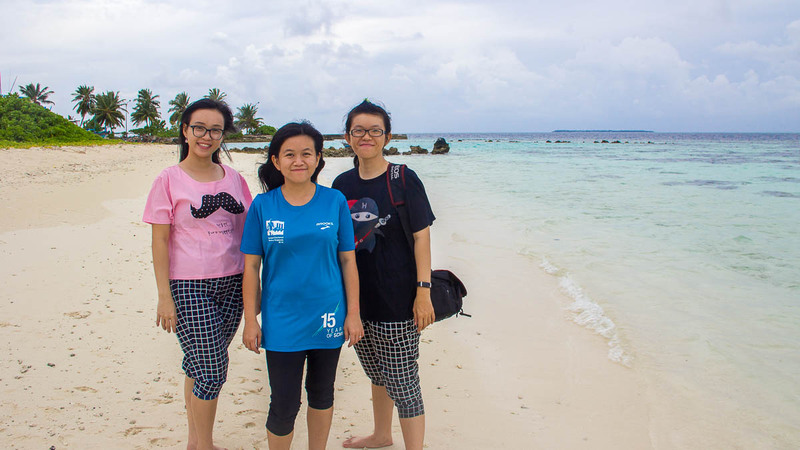 To kickstart my habit of preserving memorable stories, I will share with you 5 personal stories during my Maldives trip. This story takes place on the day we arrived in Maldives. 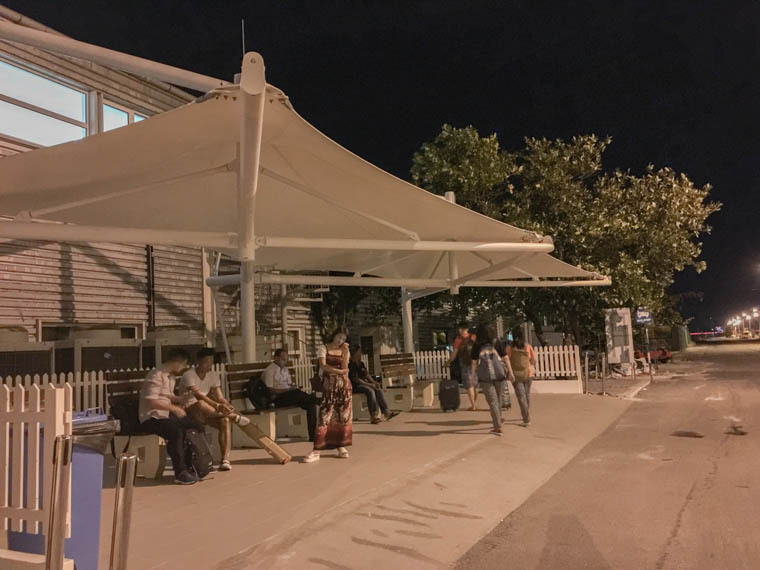 At the airport, after buying SIM cards and changing money, we walked to the bus stop to catch the shuttle bus to Hulhumale. We arrived at the bus stop in time, and a lot of people were boarding the bus. When it was our turn, we were denied entry because the bus was full! Stunned, we told him we’re fine to stand on the bus. But he said standing on the bus isn’t allowed and he insisted that we wait for the next bus, which was scheduled to depart in half an hour. We were dead tired from long flights, dead hungry and we couldn’t bear the thought of having to wait another half an hour at the airport. The bus staff wouldn’t let us in no matter how we begged. So, we had no choice but to buy expensive burgers from Burger King, while waiting for the next bus. Oh, well, that’s part and parcel of travelling, I guess. We celebrated my sister’s birthday in Maldives! Yay! 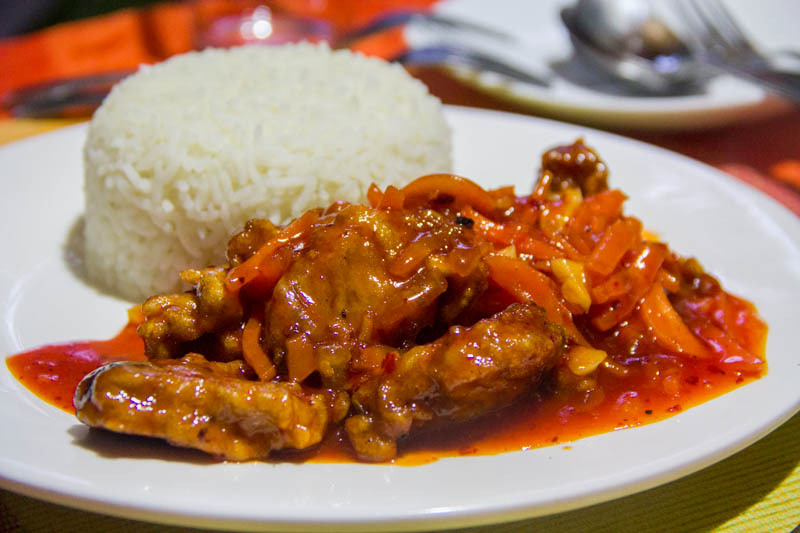 It wasn’t glamorous, there was no cake, but there were spaghetti and eggs, which are the important food to be eaten on one’s birthday according to Chinese’s tradition. 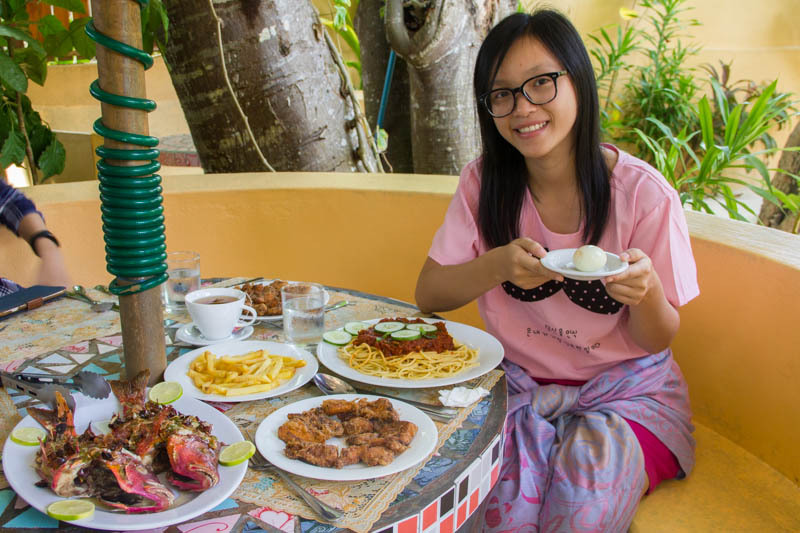 Our lunch at our guesthouse, Kalaafaanu Retreat, was a feast. At night, we had another feast at Green Leaf Restaurant. And there’s another story related to that dinner, which I’ll write in more details below. On our third day in Hangnaameedhoo, we were walking around in the late afternoon, trying to find a restaurant. We decided to have dinner at Green Leaf Restaurant, so we placed our order at around 4.30pm and told them we would come back at 6pm to eat. At around 5.30pm, it started drizzling. We ran to Green Leaf to shelter ourselves from the rain. Our dinner was served at around 6pm. We joked with the waiter that we wanted to borrow umbrellas from him, but he said he couldn’t lend us. We ate while praying the rain would stop. After we finished our meal, we settled our bill and waited for around 30 minutes for the rain to subside, unfortunately, it didn’t. In fact, it grew heavier. There was no way we could run to our guesthouse without umbrellas, as I’m carrying a DSLR and all of us carry smartphones. Finally, the waiter lent us a huge umbrella, not two! So, four of us stood closely under that one umbrella, walked on the dark flooded streets, trying to navigate the right way to our guesthouse and questioning ourselves why we didn’t have dinner at our guesthouse instead. Thank God, we finally made it to the guesthouse! After that day, we always carry umbrellas when we dined out in Maafushi! I know that I am prone to motion sickness. So, I carry motion sickness pills during this Maldives trip and always eat them before ferry rides. What I didn’t know was my hubby is also prone to motion sickness. What can I say, he didn’t know it either! 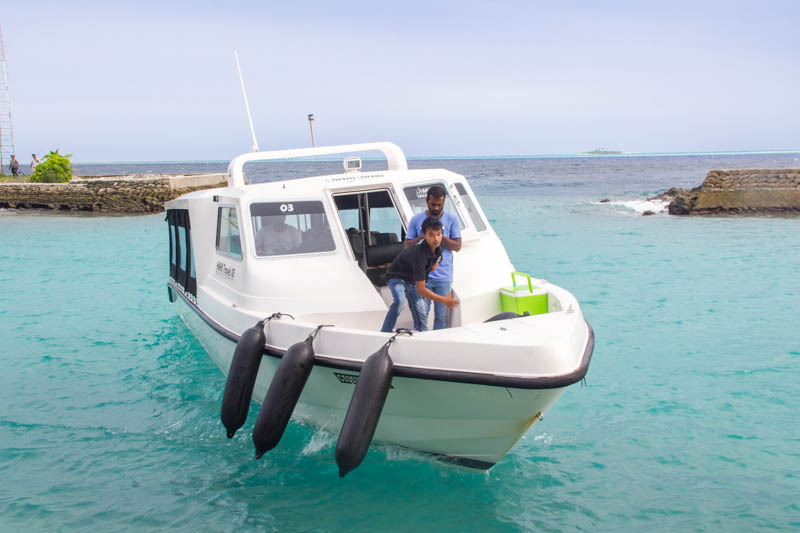 We decided to take the speedboat from Hangnaameedhoo to Male because the 5 hours public ferry ride is too uncomfortable for hubby and we wanted to catch the public ferry from Male to our next destination, Maafushi. Before boarding the speedboat, I took 3 motion sickness pills. Hubby refused to take the pills. The speedboat was fully covered with very little air circulation. In the first few minutes, I’ve already known it’s gonna be a challenging ride. True enough, I literally couldn’t do anything on the boat, except closing my eyes and praying that I won’t vomit. Not long after, I grabbed the plastic bag from the pocket of the seat in front of me. And I threw up! Then, he threw up again! Damn, it was a hell of a ride! Then, they opened the front door of the speedboat, as well as the ceiling and the side window to let fresh air come in. It felt great and both of us didn’t throw up anymore. By the time we arrived at Malé at 9 a.m., both of us were traumatic with the thing called speedboat. Hubby swore he wouldn’t ride long journey ferry or speedboat anymore. I hope he changes his mind! 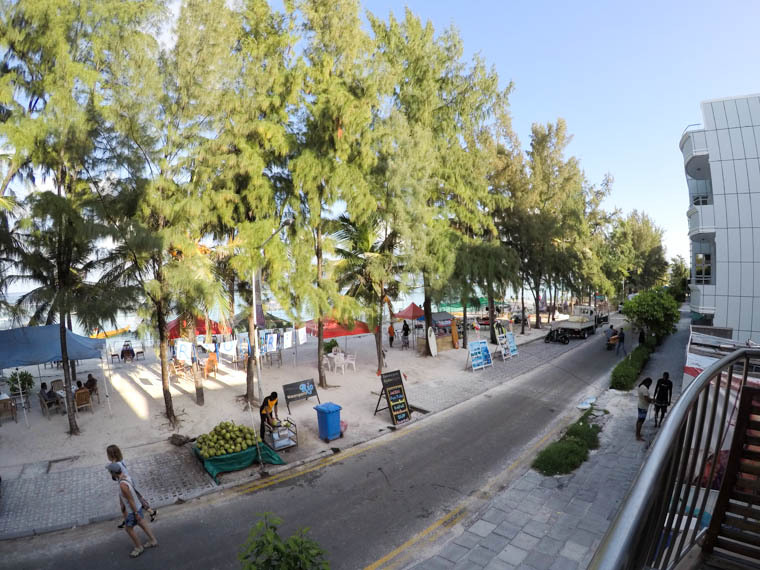 On our first night, we stayed in Noomoo in Hulhumale and we thought Hulhumale was a quiet island with nothing much. Meanwhile, on our last night, we stayed in Fuana Inn in Hulhumale and we thought Hulhumale was awesome! Even though these 2 hotels were less than 1km apart, the location of Fuana Inn is so much better than Noomoo. 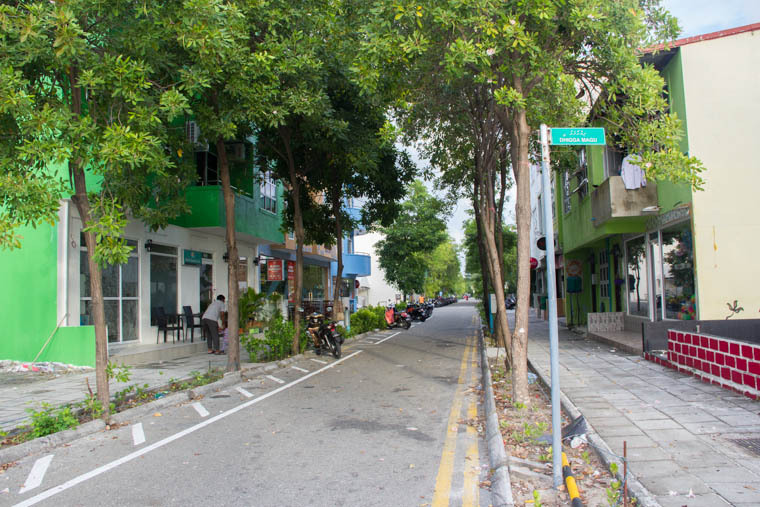 The quiet street in front of Noomoo Maldives. It’s funny how changing a hotel can shift one’s perspective of a place! So glad that we gave Hulhumale a second chance. The next time you find yourselves disliking a new place, perhaps consider changing your hotel?